This is an odd (and long) one, which, because it’s not a direct quote, I’ve put in the category of Fake Buddha Stories. Tara Brach has a blog post called “Inviting Mara to Tea.” Now Mara, in case you’re not aware of him, is a character from the Buddha’s life. He’s what we’d call a “supernatural” being (although Buddhism sees him as entirely natural, but not from our realm of existence). He represents doubt, and so most western Buddhists take his appearances as being a poetic representation of our inner doubts. He frequently appears to the Buddha and to his disciples, often in a very taunting way. One time he visited the Buddha when he was in pain from an injury, and mocked him for just lying around. He famously sent his armies to distract the Buddha from gaining awakening. Here’s a reference to that encounter. Mara appears to all of us in the form of our doubting thoughts: I can’t do this. No one likes me. Meditation is a waste of time. Brach is correct at the beginning. The Buddha doesn’t have to send Mara away, because Mara is a personification of the mental state of doubt. What we do with doubts is to recognize that they are not reality, but are distorted constructs in the mind. When we see our doubts as doubts, they lose their power over us. When we see Mara, Mara vanishes. But when it comes to having tea with Mara, I’m very skeptical. For a start, there’s the question of tea. 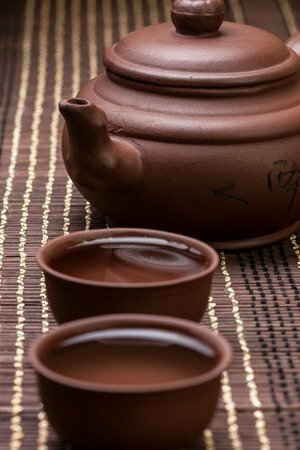 According to Wikipedia, tea likely originated in southwest China and wasn’t commercially grown in India until the British arrived. There’s no mention of tea in the Pali canon, and my Pali-English dictionaries don’t even include a word for it. In fact, the only drinks I recall being mentioned in the Pali canon, with the exception of spirits and fermented beverages, which were forbidden to Buddhist practitioners, are water and (more rarely) milk. Fruit juice is allowed in the monastic code of conduct, but I don’t think I’ve ever seen it referred to in any of the discourses (suttas). Then there’s the question of receiving Mara as an honored guest, which doesn’t fit with any of the encounters that I’ve seen. “Oh, my old friend has come,” says the Buddha, as he warmly greets Mara, inviting him in for tea. Again with the tea! Jack goes on to say, “In one scripture the story ends when Mara becomes awakened as a Buddha himself.” I think we should leave that one for another time! Although various monks and nuns addressed Mara as “friend,” as far as I’m aware the Buddha is never depicted as having referred to anyone that way, since doing so would have implied an inappropriate sense of equality. Except for times when the Buddha calls Mara by his alternative name, Namuci (a demon in Vedic mythology), he addresses him as “Evil One,” pāpimant. There’s one long passage dealing with the Buddha’s tea-break with Mara in a transcribed talk that’s available online. I would like to tell you a story that took place a number of years ago. One day I saw the Venerable Ananda—you know who he is? Ananda is a cousin of the Buddha, a very handsome man with a very good memory. A little later he says “Sometimes Ananda was so concerned about the happiness of the Buddha that he forgot about himself. Sometimes he did not enjoy what was there in the present moment, being much younger than the Buddha.” The problem here is that tradition has always held that Ananda and the Buddha were exactly the same age — even born on the same day. So where Nhat Hanh is getting this from is rather a puzzle. The story goes on to have Mara propose to the Buddha — over tea of course — that they switch roles, since being Mara is apparently hard work. The Buddha points out, though, that being a Buddha is hard work too. — it seems odd that this amazing story should be so elusive. At first I wondered if Nhat Hanh made this up for the purposes of entertainment, and that other teachers subsequently assumed that such a respected teacher, referring to an incident about the Buddha’s life, must be referring to a canonical passage. On the other hand, there’s a 1991 book by Jack Kornfield and Christina Feldman that includes this story (predating any TNH reference I’ve found) so perhaps they’re the originators, or took the story from a non-canonical (possibly commentarial) source. I’m honestly baffled! If you’ve stumbled across a scriptural source for this story, please do let me know about it! Ohh that’s sharp observation about tea! Seeing how many chai shops are scattered throughout India, one is forgiven when making assumption that there may have always existed a chai culture. Thank you for correcting this misunderstanding! Ancient India does seem to have had a distressing lack of hot beverages! One can read the story in the book preview. That was very helpful, Nick. The story you linked to is rather different, but I can imagine it evolving into the version that involves the Buddha and Mara having tea together. Thank you for this. The Westernization and cute-ifying (yeah, I made that up) of Buddhism are signs that we Westerners don’t want to work too hard at the ferocious work of meditation. The Hopi Native Americans have also had their difficult wisdom rendered fit for an up-scale meditation catalog. He represents doubt… Mara appears to all of us in the form of our doubting thoughts: I can’t do this. No one likes me. Meditation is a waste of time. there are a very few passages where mara seems to be presented metaphorical in the same way that we would say ‘the devil is in the detail’ or ‘this telephone is cursed!’ but understand this to be a metaphor. however, i wouldn’t be able to think of passages that make him a psychological representation of doubt in the canon or that the students of the Buddha would think of mara in this way. i’d be interested in they types of passages you’d produce to back this up, though. Sometimes Mara’s thoughts are described, including the thoughts that he had before he appeared to a particular person. Since it’s unlikely Mara sat down and narrated his memoirs to anyone, I think we can take it that this indicates that Mara is a literary device. I’m happy to assume that when early Buddhists talked about meeting Mara they were well aware they were simply personifying doubt. Death is in your presence. Death has 1,000 parts of you. Only one part is your life. Live, good sir! Life is better. Foolish girl, have you no fear of rogues? what is this dreamer, this sleepy-face? So Mara is voicing (very convincingly, I think) the kinds of spiritual doubts people (including the Buddha) tended to have. According to the Dictionary of Pali Proper Names, “the term Māra, in the older books, is applied to the whole of the worldly existence, the five khandhas, or the realm of rebirth, as opposed to Nibbāna.” The PTS dictionary says the same thing. So it seems that Mara was, from the earliest times, often seen as an abstract principle as well as a supposedly existing entity. 1. the suttas are not like the bible: it’s usually made clear whether something is meant to be taken as fact, simile or a story, pretty much in the same way that we use speech. mara is only in the rarest cases depicted to be a metaphor but in very many as just another being, in the same language in which meetings with other ghosts, deities etc. are described. 2. if you insist on metaphor, what do you make of passages like in M 50 where an extensive narrative shows mara (& past mara) in rather typical action for deity mara but making such a sutta into a metaphor would end up being serious nonsense & very disrespectful to ven. maha moggallana (violent fantasies/psychotic episodes of somebody with a stomach ache?). what do you make of mara preventing the Buddha from getting almsfood, mara being explained to be a visible cloud or disturbance to monks by the Buddha or the events in D 16 with your psychological approach? – that this approach just doesn’t work for very many places is my point. 3. as you know, there are lists like the one in M 115, where women are said to be unable to be buddhas, brahmas, sakkas, maras & wheel turning emperors. which of these do you consider metaphor and which real and how does the text bring this out? 4. this position is found mostly in secular cultures where you don’t have well-known highly respected members of the community (monks, nuns, but also some lay people) who have direct experiences of other realms. the overlap between these psychic experiences is substantial and consistent, the people are known to be otherwise mature. the result is that this cosmology has credibility similar to that which we may have of a continent where we haven’t been yet. my question to you would be this: have you ever had somebody who credibly lay claim to having psychic powers that make him or her able to consistently see other realms tell you that mara doesn’t exist? i bet you haven’t, because this minority position exists only among few scholars & westerners catering to a secular, psychological audience who are just in general ashamed of buddhist cosmology and try to edit it out where they can. big job, by the way: in the rather ‘reasonable’ majjhima nikaya, about two thirds of texts make some mention of it, with quite a few stating that it’s essential right view to have this correct and that you should put your trust in people who claim direct experience. 5. most importantly: the type of thought, doubt, reservations you are attibuting to the Buddha & arahants are thoughts that even reasonably mature people don’t have, let alone people who are done with the world and have good samadhi, not to speak of Buddhas & arahants. the point is that most buddhists would not consider somebody assuming/surmising/accusing a Buddha to have such thoughts to have anything approximating faith in a Buddha as defined by himself. you may argue that it would still be possible to consider someone like that mature by some freudian, jungian or other psychological standard. personally, i doubt even that, though. if any major player in the field of psychology would publically broadcast having such internal dialogue, let alone bring up this imaginary figure regularly, quite out of the blue, assigning him control over events in his life, he would lose the respect of the community very fast. nobody does this, of course, and i believe they would be correct in dismissing such a weirdo. – you certainly wouldn’t want your kids around him, right? not everybody who broadcasts such positions takes the time to think through the implications but i think it’s worth looking at the brazenness & insults such positions imply, mostly so that people are a little bit more careful with these ideas. What a lot of words! Well, you’re free to take everything that happened in the Suttas as literal truth if you want. It doesn’t bother me. To me they are documents that evolved over a long period of time, and I’m quite sure that stories that were originally intended as ironic, joking, or symbolic have come to be presented as literal. And I’m also quite sure that some passages describe events which have been mythologized. You say, “it’s usually made clear whether something is meant to be taken as fact, simile or a story.” Usually? So not always? So you’re accepting that something that may appear to be a factual event may actually be symbolic? thanks for your reply. which of the ‘lot of words’ do you find superfluous to make my point, that this is not a buddhist position and in turn would preclude someone with such a view from becoming, for example, a streamenterer? the passages i’m thinking of would be a very few odd presentations like ‘the partridge brahmafaring’ at Cv 6 or the way the number 84 000 is used – quite obvious outliers. on the whole, the language indicates that what is said by the Buddha is meant to be taken literally. in A 6.62 (somewhat similarly at A 10.75) the Buddha actually comes down quite strongly on those who try to question the literal truth of his words. in brief: my main point is the one about the ridiculously immature person this position accuses a Buddha to be – quite without evidence. Apologies if that comment about “a lot of words” sounded snarky. I was just surprised by the volume you wrote, and was trying, not very skillfully, to register that I don’t have the time or desire to respond to what you wrote in detail. The idea that it’s “not a Buddhist position” to take some passages of the suttas as symbolic or mythologized isn’t one I agree with. At best the suttas contain some verbatim transcripts of some of what the Buddha said. But often I regard them as akin to “lecture notes” — and having lectured I am very aware of how students’ notes can simplify and even distort what was originally said. (The stilted and repetitive nature of the suttas is an example of that.) At worst, some suttas contain material that was invented by later Buddhists in order to justify some doctrinal position they held (that can be seen by comparing the Pali suttas with translations into Chinese). If a sutta says that what the Buddha said is to be taken literally, that begs the question, since we can’t be sure what the Buddha originally said. It’s not unlike those Christians that say the Bible is the literal word of god. How do they know? Because the Bible says it’s the literal word of god. Texts are valuable sources of information, but I am always going to treat them as historical documents to be read critically. I dispute the assertion that this means that stream-entry is impossible; in fact I’d say that to insist on the literal truth of ancient documents is a manifestation of the third fetter. well, bodhipaksa, i’ve been in discussion with people at the helm of this discreditation of the suttas for quite a long time. for almost every idea they develop as possible indicator for late intervention, when you develop a different model that explains it as congruent with a very near continuous model, they have nothing further to say. those speculations about interpolation are just ideas that seem plausible to those who look for them. usually these critics are dominantly influenced by western academic methods and, to me, they poorly account for the way careers are crafted in that culture, namely by associating ones name with speculations that attack current consensus. and the vast majority of those ideas seem ridiculous to outsiders & history. – from the buddhist point of view, they not only lack direct knowledge but typically also basic integrity to spiritual values, i.e. potential consequences. personally i’m persuaded so far – like the vast majority of theravada monks in the world – that changes in original Buddhaword have been negligible & augmentation is obvious – i.e. there is not attempt to hide it – in the few places it happens within the four nikayas and a good part of the fifth and the first four books of the vinaya (e.g. D 16 end or M suttas taught after the passing away of the Buddha). the reasoning behind this faith in the suttas as original is not only a felt internal congruence of the material that later interpolation cultures (e.g. mahayana suttas) lack. it’s dominantly also the way that suttas are preserved within monastic culture. monks may have outside preferences or they may lobby to have a favorite interpreter canonized. but to tinker with the original is quite another matter it’s also not easy to do because of the decentralized preservation. where it has been attempted (we would presume in the agamas), it’s working with sanskrit translations by people foreign to that culture and typically of other persuasions, i.e. interested primarily for academic reasons. i believe it’s most likely that the Buddha himself established the way the suttas were formatted, since he passed previously given talks on to ven. ananda for decades. ven ananda would then, under the eye of the Buddha, teach these texts to other monks and so they would spread to a multitude of small indepent, decentralized communities. misquoting the Buddha was considered extremely serious throughout monastic culture and the Buddha enforced this with rules and harsh public trials. to this day, most monks would be very careful with that, whatever other flaws they may have, because this is emphasised throughout moastic training and reiterated every two weeks in the comunal patimokkha recitation. at the core of the entire debate is, however, that of refuge in the Buddha: within the canonical framework, Buddhas are extremely rare beings that cultivate kamma, i.e. potential, to understand & communicate pertinent truths, to extreme heights. both internal & external aspects of a Buddha’s life are calibrated for the purpose of establishing & maintaining that potential optimally. the Buddha himself says repeatedly that they way this will be destroyed is by (pro-)buddhists, who lack faith in the Buddha as presented in the suttas and then they become careless (e.g. S 20.7; S 16.13 et al). so here we are: you believe the Buddha and some of his arahants to be full of silly doubts expressed in goofy methaphor with little relevance to time & place (eg ven mahamogallana talking to himself when having a stomach ache) or any indicator that these are his doubts or good solutions. how much more profound can you go with disrespect (i know, the mahayana top that at times)? moreover, this depiction of the Buddha is completely incongruent with the quite homogenous portrayal of the Buddha that the vinaya & nikayas offer. it’s also obvious how the teaching declines in consequence, if you know that scene of self-appointed slashers: they never have the patience & humility to struggle with counterintuitive instruction, giving it time to ripen. instead, they just pick a few teaching that they find inspiring. then they spend most of their time denigrating the teachings that make no sense to them amongst each other. the way this works as a block is canonically described in different ways but most psychologically at A 10.76 (uparambha-citta, i.e. criticising mind). the condescending tone – without offering substance for your views – that you bring to this discussion is just one aspect of this process but one easy to observe & understand. furthermore, students of those who hold those views usually don’t know suttas or vinaya to any relevant degree believing the material to be entirely unreliable, which makes this basically a discussion amongst a few rather visible nerds. not having answered to my previous reservations, i can understand that you find this post unpleasantly long & for reasons mentioned above, i doubt that you will change your position or learn anything from it. – sorry for using up your time! however, i respect your publishing such dissenting positions and took the time here to develop this position because i haven’t seen it done a lot, even though it’s the view of a majority of experts on the matter and has substantial backing. so thanks for that opportunity! Wow! So as a newcomer to meditation and the path of Buddhism, thank you for the assured tone of your “to many words”. Doubt and doubts are easy and destructive. I don’t know anything about suttras or what they or any other teachings say, real or implied. What I do know is this morning, coffee in hand, as I read a quote about “there’s not enough darkness to snuff out a little candle”, I was directed to this great site. After clicking through this article and reading the comments related to this post, I have to say thank you to both of you. I have learned a great deal from both of you. Most importantly, I need not live with fears and doubts. Be it “friend” or “evil one” or whatever you need to call it, I can step through the fear and doubts. Secondly, confirmation I want to rid myself of my defensible ego. I wish not to be defensive on any front. I gain more knowledge and knowledge of self by being open what possibilities the other “side” might teach me. Thirdly, respect for each other’s knowledge, contributions and commitment to enlighten for other seekers who are just beginning, or are already well on their paths. So again, thank you both for who you are and what you do. that’s diligent of you to read through that much text, all the more as it unfortunately has a somewhat cantakerous tone. this tone stems from this being really an insider discussion among people who agree on 99% of content. in this disagreement, one side sees the original source as highly contaminated and in need of purging, the other feels that the source is good and the people who want to purge are just not patient enough to get to the bottom of it. quite a bit of it is about personalities & association, too. as far as fears & doubts are concerned, i believe both our sides would agree that most human experience is far more deeply permeated with them than is typically acknowledged. fear & doubt are inherent in attachment, that is liking pretty much anything: with it comes the possibility of loss and not knowing how it may occur. the less attachment, the less fear and doubt. works also very specific: anything you don’t care for, will not worry you. having said that, radical honesty implies and the right kind of non-defensiveness imply a kind of humility (reduction of ego) that signals detachment (from fear of consequence) and is thereby almost magically able to reduce fear & doubt very tangibly. one easy way to effect this is the impression that someone else can see right through you [this is often used by religions]. another way to sublimate fear & doubt is concern about greater things. yet another is to completely focus on something that you are pretty sure is good & important in the present moment. while this is useful only in the context of a regular look deep into the future, it can help clear the mind of clutter, lead to better decision making and cut waste of energy. not sure if you plan to get deeper into real buddhism or who māra is but all of these effects are very viscerally supported by the original māra teaching of the Buddha. … that is one reason why ppl like me feel that it’s a shame to just delete because of limited appeal to the adherents of the secular religion of psychology. Oh please go sit in silence, then go out and do something real to relieve as much suffering as you can. concerning the article: i personally cannot consider anybody buddhist, who sees the Buddha or arahants as doubting, sorry figures who talk to themselves, when they have nothing to do. nor does the language in the canon suggest this to be the case. the [suggestive] lament that encounters with māra do not recor in every account of the bodhisatta’s struggle for enlightenment hints at inexperience in reading the source material. practically no element of that struggle occurs in every account and most have elements that don’t occur in other presentations. – just as the way we describe our earlier years selectively. example: that the first girlfriend isn’t mentioned in a CV, is no indicator for or against her existence at all. factually wrong i believe to be in the article that māra is said to be a handsome devaputta in the early sources. canonically, there is to my knowledge no instance where māra is called either ‘devaputta’ or ‘handsome.’ – i would be grateful, though, if one could be pointed out to me.